Yesterday was another great time of ministry at the San Juan Capistrano train station. I brought my recently printed Ten Commandments poster (thanks to Stuart Scott of Living Waters) and set it up behind us, which helped to cause people stop and listen to the preaching of the gospel. We were joined by Rich, Dave, and Fema (and their son), and of course Tracy and the kids were there too. Rich and I sang several songs while Tracy, Dave, and Fema passed out plenty of tracts. Dave and Fema had to leave so we prayed together that those who heard the gospel preached and received tracts would come to repentance and faith in Jesus. At that point, I stepped onto the box to read Exodus 20 (for Project Ezra) and to preach the gospel one last time. I finished reading and just started to preach a gospel message when a man jumped out of his taxi and approached me, stood right beside me, and started to heckle me. 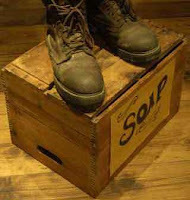 He hollered that I should get off the box and save myself from the deputies who he claimed would come and arrest me. I simply answered him that I would not stop speaking and that he was free to call the police and I just kept on preaching. The great thing about it is that everybody who was walking past us stopped to see what this irate taxi driver was going to do to the preacher on the box! The heckler simply walked back to his taxi and I got to preach the law and the gospel to everybody who was still standing around listening! God used this man to draw a crowd to hear the gospel. Glory to God!! I'll be praying for hecklers from now on! Below is the audio from yesterday. Click here if you don't see the embedded audio player. 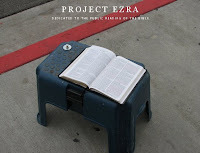 Project Ezra is a facebook group that is "dedicated to encouraging, equipping, and mobilizing born again followers of Christ, from around the world, to read the Word of God in public". I have been taking part in this project and have read the bible in public on Good Friday, Memorial Day Weekend, and July 4th. Project Ezra has recently posted a new schedule to read from various portions of the bible on a weekly basis. We will be incorporating that with our San Juan Capistrano train station outreaches every Sunday after SCCA's morning service. So, I encourage you to head down to the SJC train station and join us after service and see what the Lord is going to do as we are faithful in proclaiming the good news of the gospel. We usually get there between 12:00-12:30pm and stay till 1:30pm or so. You can email me at Jeff@LoveTheLost.org if you have questions, or to let me know that you plan on joining us. Here's a new promotional video Tony Miano put together for Project Ezra. Enjoy! This past Sunday at the San Juan Capistrano train station was another great time! I knew it was going to be good because of the simple fact that my mind was racing all morning - coming up with reasons why it was OK not to go to the train station. Whenever that happens I know that God must be going to do something amazing. My thoughts ranged from "it's going to be too hot down there in my church clothes", to "I need to lead worship again tonight and should really rest my voice". As I was listening to Pastor Dan's sermon and wrestling with these thoughts, an idea popped into my mind - just go down to the train station and read 1 John. This thought stood out in such direct opposition to the other thoughts I was having that I knew it was from the Lord. Especially since this would involve reading *loudly* for 15-20 minutes which would surely destroy my voice! I leaned over and shared with my wife Tracy that I was going to read 1 John at the train station. So, after service we drove down to the train station. I knew that Tracy has been feeling led to read with me so I asked her if today was the day? She said "Yes, I'll read chapter 4"! We prayed and I stood up on "the box" and read 1 John 1-3, Tracy read chapter 4, and I finished up with chapter 5 and a gospel presentation. It was glorious!! This was Tracy's first time "on the box" and I have a feeling it won't be the last. But, even better than that is the man who was sitting on the bench right beside us. He was visibly shaken by the gospel message. Karen had arrived when we were part way through the reading of 1 John and she said that she was praying for the man because she could tell from the expression on his face that he was being impacted. I was able to see him from where I was standing too and could see that the Holy Spirit was using the message to convict this man. After I finished preaching, I approached the man and tried to talk with him but he said he didn't want to talk. So, I gave him a gospel tract and left it at that. I have no idea what was going on but the Lord was obviously doing something in this man. Glory to God!! Click here if you don't see the embedded audio player. On Saturday we enjoyed the 4th of July parade at the beautiful home of Mark and Gina (from the CCCM evangelism team). We were there as a family and not in an "official" evangelism outreach capacity. However I did manage to pass out 200 gospel tracts and brought along my little acoustic amp so that I could take part in Project Ezra's First John on July Fourth challenge. The challenge involved reading all five chapters of 1 John and then preaching the gospel. Since I didn't have time to do this before the parade started due to difficulty finding parking, I opted to read and preach as soon as the parade ended. So, as soon as the "end of parade" banner passed, followed by the "sign guys" (see photo), I prayed with my wife, fired up the amp, and read 1 John and preached a gospel message to those who were packing up their gear to leave. It was glorious and many even stopped to listen. There was only one group of hecklers who ended up really encouraging me because they were on a distant balcony. I was worried that I would not be heard over the noise of the crowd but these helpful hecklers let me know that they could indeed hear me! If these guys could hear then hundreds of others could hear as well. Glory to God!! The facebook evangelism group Project Ezra has issued another challenge titled First John on July Fourth. Tomorrow I will be reading 1 John at the Huntington Beach parade where we will be attending a July 4 party at a friend's house. I encourage you to take up the challenge yourself and find a spot where people are gathered and just read 1 John aloud. God's word will not return void!